Including your pet in your wedding festivities! Your pets are a part of your family and having them be a part of this special time in your life is a must! It can be really fun to involve your pets but it can also be a bit stressful. We have personally seen our couples bring horses, dogs, and cats. You can incorporate your fur babies in a number of ways that fit both them and your needs. It is important to be aware of how to best take care of them while also making sure that they are a part of the fun. 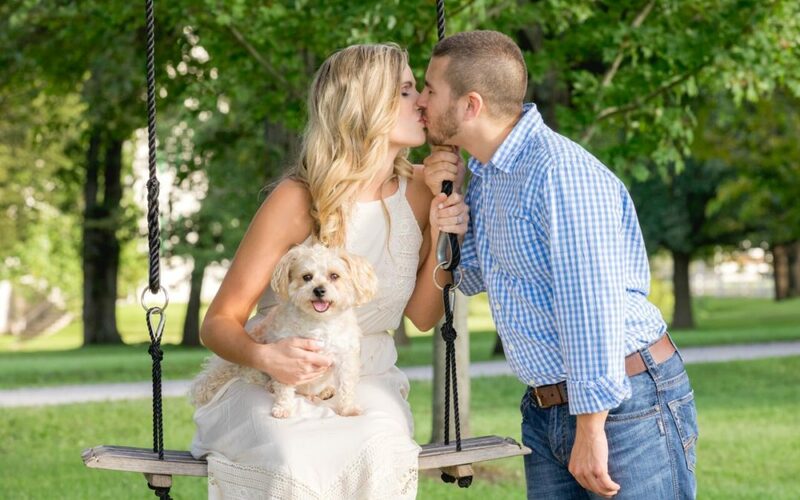 Bring someone to be in charge like a parent, sibling, or friend – It is important to have someone to take care of your pet during your engagement session. Even if they are well behaved it helps to have someone there to hold the animal and allow them to explore. You don’t have to worry about them and can focus on your engagement photos but still have them close by for any pictures you want with them. Make sure your location allows pets – Do some research before your session so that you know where your pet can and cannot be. You want to make sure that everyone will have a great time. Pet Attire – Make sure to think about the way the animal’s collar or leash looks. You work so hard to put your outfit together so making sure that your pet coordinates with your outfit is also important. Some other fun ideas can be flower collars or outfits. Bring toys and treats to help get their attention during the photos. You can also download sound apps to help get their attention as well. This works particularly well with horses to make sure their ears go up. We have had a lot of success using them with all animals. The wedding day is also a great time to incorporate your pet. This is great for very well-behaved pets that do not get stressed around a lot of people. You want to be able to focus on your special day and not be worried about your pet. Here are some tips so that you can incorporate them into your wedding day. Length of the Day – Wedding days can last anywhere from 8-12 hours. Make sure that you will have one person in charge of your pet. Your pet may be really confused as to why you cannot be with them every moment so make sure that it is someone they can trust. Make sure this is not someone from your bridal party. Their plates will already be full on your wedding day which might make it difficult for them to take care of your pet but still enjoy the festivities. Photos – To help keep your pet calm only section out a portion of the day where you will need your pet to be there. They don’t need to be there the entire day. A great time to have them at your wedding is during the bride/groom photos and the ceremony. Keeping them any longer can result in stress due to loud noises and a lot of people. Only you know what your pet can and cannot handle. Dress Them Up – This is fun time to put your pet in a suit, wear a bowtie or flower crown. Just make sure it is something comfortable they can wear and something that will last the entire time they will wear it. Make sure to do a trial run before the wedding day so that you know it will be comfortable for them. Here are some of the most creative ways we have seen people incorporate their animals. One of our grooms surprised his bride with a puppy as a gift right after their first look. We have seen a couple’s dog be the ring bearer. They tied the rings to the dog’s collar and had him sit next to one of the parents until they called for him to bring the rings up. There are all kinds of creative ways you can incorporate your pets into your wedding day. Just have fun with it!